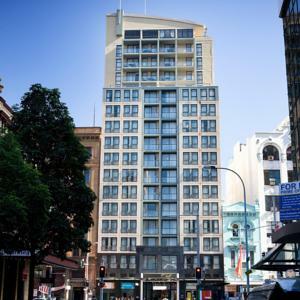 In the heart of Sydney, BreakFree on George offers modern accommodations with air conditioning and satellite TV. Sydney’s famous Darling Harbour is just a 10 minute walk away. BreakFree Apartments on George Street is a 2 minute walk from both Chinatown and Paddy’s Markets. Sydney International Airport is a 20 minute drive away. All units have a well-equipped kitchenette or kitchen with a refrigerator and tea/coffee-making facilities. Each unit has spacious living and dining areas. Some also have a balcony. The BreakFree tour desk can provide sightseeing advice and help guests with travel arrangements. The 24-hour front desk can arrange dry cleaning and currency exchange services. Chilli & Spicy Restaurant offers an extensive menu featuring Australian and modern Chinese cuisine. Alternatively, there are a number of other dining options within a 5 minute walk of the apartments. Rooms: Apartments: 159, Hotel Chain: Mantra Group, BreakFree Hotels. Internet via modem is available in the hotel rooms and charges apply. Public parking is possible at a location nearby (reservation is not needed) and costs AUD 28 per day. One child or adult is charged AUD 45 per person per night in an extra bed. One child under 2 years is charged AUD 10 per person per night in a baby beds. The maximum number of extra beds/baby beds in a room is 1. Any type of extra bed or crib is upon request and needs to be confirmed by management. Supplements are not calculated automatically in the total costs and will have to be paid for separately when checking out.